Relationships with families and schools are a key component to afterschool program quality, and communication among educators and with families will be key to building and reinforcing relationships. Afterschool educators often have informal conversations with school staff and teachers, as well as with families. Every interaction, no matter how brief, has the potential to make the case about the value, the benefit, and the intentionality that goes into providing engaging STEM learning after school. This guide provides easy and readily adaptable messages for frontline staff to communicate STEM program happenings and share children's engagement and development. 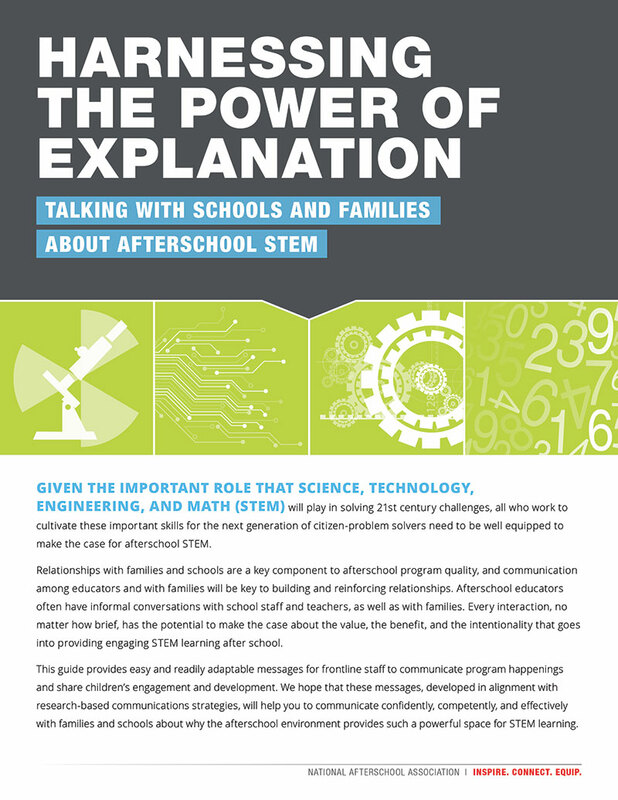 We hope that these messages, developed in alignment with research-based communications strategies, will help you to communicate confidently, competently, and effectively with families and schools about why the afterschool environment provides such a powerful space for STEM learning.